They say that the proper number of bikes is always one more than you already have, and that’s especially true when you have a done deal on a custom ti frame. Ah, but what form should that frame take? I don’t need a custom road bike since I am quite happy with Bianchi’s stock 49cm geometry. My Sycip travel bike is so spot on for so many purposes that the potential weight savings of a titanium construction don’t quite justify replacing it. One genre of bike about which I’ve been fascinated has been bikes with small-wheels or, as the Japanese have dubbed them, mini-velo bikes. Whenever I brought these up in conversation with Bill Davidson, he mentioned a now forgotten style of racing called Formula 1 BMX. Little information is available now, but it seems as that as BMX racing was waning in the late 1980s organizers tried to diversify by having street BMX races. Instead of berms and doubles, the races were held in parking lots with tons of cones marking the course. The bikes resembled mountainbikes with 20” wheels and a rear derailleur only. Ultimately the race series folded, as mountainbikes would dominate growth in cyclesport and the product market for the next few years. When thinking about what to do with my next bike project, I remember how much fun a BMX can be. My one complaint is that the single-speed set-up with low gearing really hampered getting around town in a timely fashion. Then it struck me that a BMX with a rear derailleur would give the bike some wings. One critical decision was the type of rear dropout. I thought about going with slider-type dropouts like on Byron’s Davidson Modal, but I decided that this bike was about versatility without having to convert “modes”. I wanted a bike that I could play on when a road ride sounded boring or inconvenient. I plan to run this bike with a derailleur at all times, and slider dropouts don’t make much sense unless you plan to go single speed at least some of the time. I decided to go with disc-brakes. In the past I’ve advised against disc brakes on S&S bikes that will see a lot of packing, since I was worried about the rotors getting bent. Recently I’ve gotten a little bolder, so I’m going to chance it. 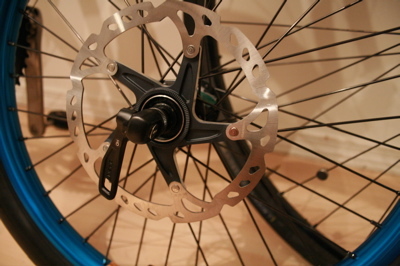 Besides, the better Shimano Center-Lock rotors have a stiff aluminum carrier supporting the rotor; they don’t bend that easily. 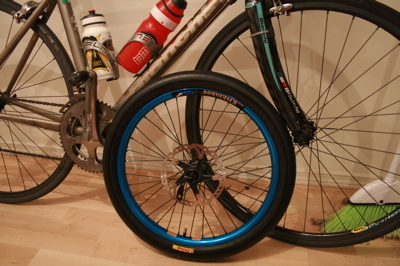 Additionally, I plan on sometimes removing the front disc brake for the duration of a trip to ease packing. After all, racing BMX bikes rarely use a front brake anymore, even if I like having one on usually. Talk of front brakes leads me to fork and front hub issues. Buying a fork off the shelf would make things a lot easier, since custom forks are labour intensive. However, BMX forks don’t use 9mm dropouts like most MTB and all road bikes. They are sized to fit 3/8” axles (for racing forks, but many trick BMX forks use 14mm axles). Disc-compatible MTB front hubs would normally have wiggle room in the dropouts, which isn’t something you want with disc brakes. Happily Shimano hubs now use 10mm threaded axles that are machined down to 9mm at the ends; I merely cut a 10mm rear axle down to length and installed it into the hub. Now Davidson just needs to weld disc-mount tabs onto the fork, and we’re in business. Since this bike isn’t what Davidson normally builds, it would be a good idea to have the wheels built with tires and rotors when building the frame. I really wanted to show off the disc brakes, so I hunted down front-specific rims that had no brake track for both front and rear of my bike. I found these 20” KHE “Big V” rims on overstock. Not only were they cheap, but they are anodized blue and are really light (sub-300gr). However, they are not the most precise rims out there. When building the wheel, I had to make some sacrifices in roundness in order to have more even spoke tension, because you can’t have perfect tension and roundness without a perfect rim. 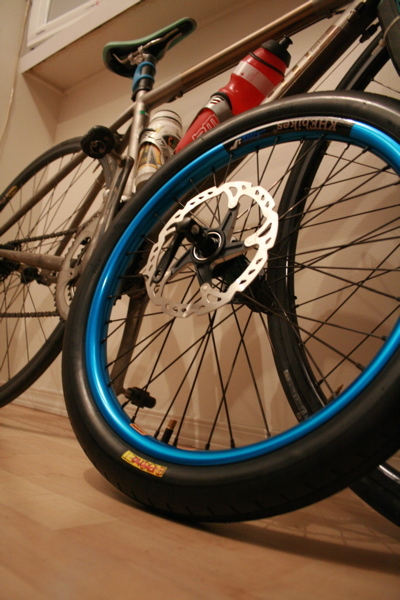 I chose these wide rims because I want to run fatty BMX tires; much like with the Hed C2 rims, I am a firm believer that wider rims get better tire performance. In the end, the tires aren’t perfectly round either, so the rim being .5mm out of round is irrelevant anyways. For hubs I’m going with Shimano SLX. They are both Center-Lock rotor compatible and available in the 36H drilling dictated by the rims. I’ll update on this bike as the project progresses. I hope to have the bike done by August so that I can enjoy the end of summer with it, and there is also the outside chance that I might go to Japan with BMX dudes. You know…have bike, will travel.